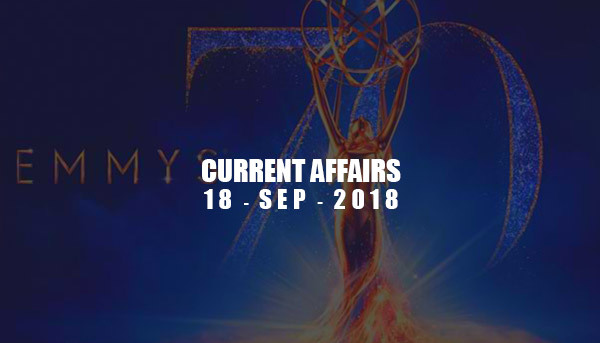 Current Affairs - Sep 18, 2018 - IAS - Daily Current Affairs, IAS Syllabus Exam Strategy, IAS Preparation. First time since 2014, Goldman Sachs has downgraded Indian Equities from BUY to HOLD. Reasons cited were Expensive Valuation and Upcoming Election. Goldman has been bullish on Indian stocks since March 2014 because of expected 'pro-growth government policies and structural reforms'. Goldman Sachs is a multinational investment bank and financial services company headquartered in New York, US. HBO series Game of Thrones won 9 awards at this year's Emmy Awards given by the Academy of Television Arts & Sciences. Billionaire Yusaku Maezawa is set to become the first paying passenger to the fly around moon trip. SpaceX founder Elon Musk, termed him 'the bravest person' for the 'dangerous mission. SpaceX is has planned various test flights before final manned mission in 2023. The SpaceX's BFR rocket will take him to this journey. He is founder of Japan's largest clothing website zozotown and haing USD 2.9 bn net worth. He is well known for his art collection, and drummer at Punk Band. The United States has imposed 10 percent tax on an additional $200 billion Chinese goods, this will increase to 25 percent next year. This new tariff has intensified the trade war between both the countries, effect of which is being felt on global market. Earlier US put tarrifs on $50 bn of Chinese goods. Along with this new tariff US has thretened that any retaliation from Chinese side will invite tarrif cover on further $267 bn of goods left. Boards of Bank of Baroda, Dena Bank and Vijaya Bank are adviced by Governmet to merge the three Banks. Merged entity will form India's 3rd larget bank. Government also assured that no employee will face adverse service condition due to this merger. Germany has launched the world’s first hydrogen-powered train named ‘Coradia iLint train’ built by French TGV-maker Alstrom, it can run 1,000 kilometres on a single tank of hydrogen. Bangladesh cabinet approved agreement that allows India to use the Chittagong and Mongla seaports for transporting goods to and from its land-locked northeastern states.